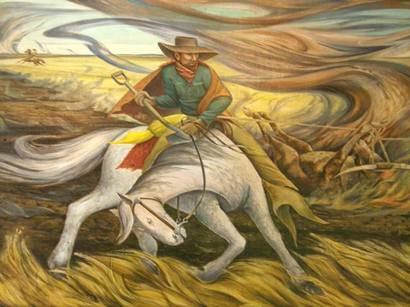 Brownfield, Texas WPA mural Ranchers of the Panhandle Fighting Prairie Fire with Skinned Steer by Frank Mechau. 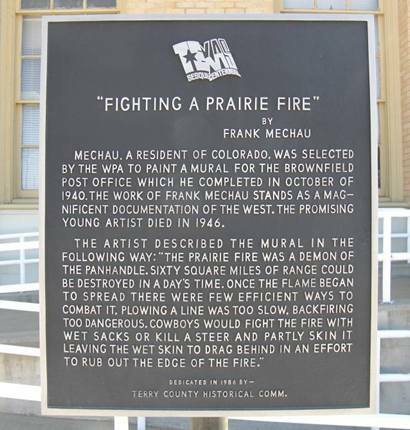 Fighting Prairie Fire with Skinned Steer"
Born Frank Albert Mechau Jr. in Wakeeney, Kansas, Mechau spent most of his (abbreviated) life in Colorado. 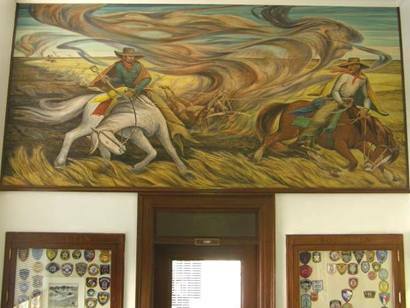 In addition to the Brownfield mural, he installed three canvases in the US Courthouse in Fort Worth (now called the Eldon B. McMahon, courthouse). Frank and his devoted wife Pauline met in a Manhattan bookstore and sold their book collection to finance a trip to Europe. To finance his art education he worked as a cowboy for the railroad and engaged in prize fighting. 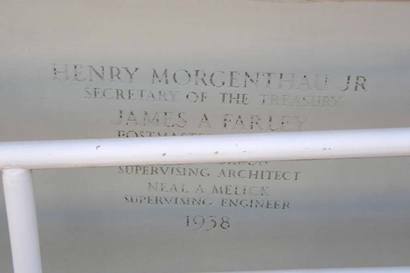 He taught artist Ethel Magafan who was also a noted muralist. One of his murals in Washington, D.C. of Indians attacking a wagon train has become a point of controversy in recent years for its portrayal of Native-Americans. His wife Pauline (a Colorado conservationist) supported the family after Frank�s untimely death by forming a folk-singing group � made up of she and her children. She survived her husband by 59 years, dying in her beloved Colorado at the age of 98 in 2005. 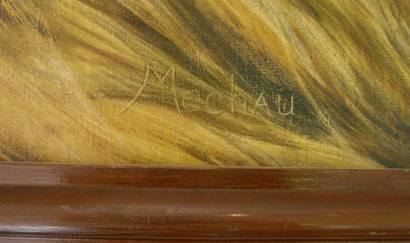 Mechau, a resident of Colorado, was selected by the WPA to paint a mural for the Brownfield Post Office which he completed in October of 1940. The work of Frank Mechau stands as a magnificent documentation of The West. The promising young artist died in 1946. 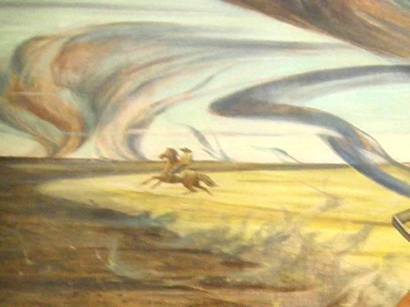 The artist described the mural in the following way: "The prairie fire was a demon of the Panhandle. Sixty square miles of range could be destroyed in a day's time. Once the flame befan to spread there were few efficient ways to combat it. Plowing a line was too slow, backfiring too dangerous. Cowboys would fight the fire with wet sacks or kill a steer and partly skin it leaving the wet skin to drag behind in an effort to rub out the edge of the fire." 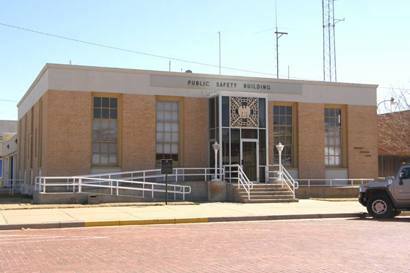 The former Post Office is now the "Public Safety Building." 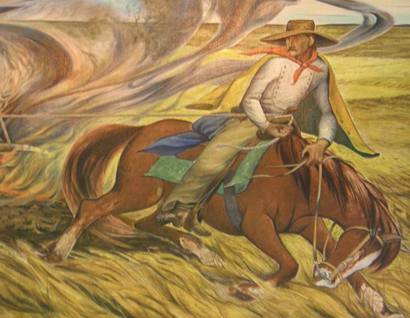 A detail from the mural was used for the cover of the book The Texas Post Office Murals. Image left shows the detail as it appears in place, while the right side shows a reverse image for the cover.